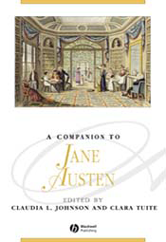 Reflecting the dynamic and expansive nature of Austen studies, A Companion to Jane Austen provides essays from a distinguished team of literary scholars that examine the full breadth of the English novelist's works and career. Provides the most comprehensive and up-to-date array of Austen scholarship. Functions both as a scholarly reference and as a survey of the most innovative speculative developments in the field of Austen studies. Engages at length with changing contexts and cultures of reception from the nineteenth to the twenty-first centuries.